All our Crystal Healing events/trainings in delhi are conducted by certified Crystal Healers, who have at least one year of professional experience. When you book an event/training at Life Positive, you are protected by the Life Positive seal of trust. 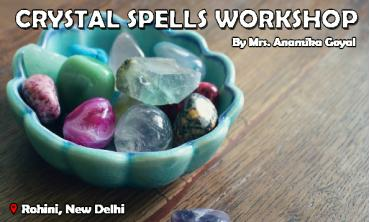 Join us in this exciting workshop on Crystal spells. This course will help you discover dozens of rituals and methods to solve love, home, career, spiritual growth and much more. A reputable crystal healing course in Delhi makes you a certified crystal healer. You learn a lot about these "magical" stones. In the course, you learn how to choose a crystal. Every crystal has a specific healing frequency and structure. When they resonate with your frequencies they create a healing effect on you. So, the choice of crystals is also important. Not every crystal works for everybody. During crystal healing courses in Delhi, you also learn how to store and cleanse crystals. This is important. Crystals need to be sparkling clean for maximum benefit. Apart from this, the course teaches you about the seven chakras of the body. Only when you know about the energy points of the body can you place crystals properly for healing. Crystal healing courses in Delhi also teach you meditation with crystals. Crystals are usually formed underground. This takes millions of years. They undergo various chemical reactions. The way they are formed makes experts believe that they imbibe energies through all their years of formation. Crystals possess different compositions, depending on the mineral type. A certified healer has all the knowledge about crystals - about their compositions, the energies they hold, how they heal, how to place them, and what crystals suit what person. Usually, the healer places a suitable crystal or crystals on specific points on the body. Before that, the person is made to relax and lie down. The crystals are generally placed for about 20 minutes, but the time varies with individuals. Many people report that they feel warm due to the energies. Some feel nothing. But that does not mean they are not healed. Some may feel better immediately as the negative energies flush out, while some take time to feel a difference. 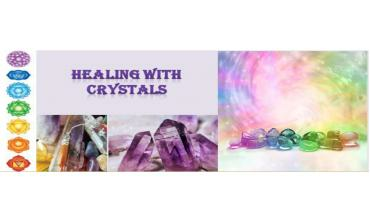 Crystal healing events in Delhi give you a golden chance to learn about crystals. You can become a certified healer. You can heal yourself and others. Enrolling for a crystal healing event in Delhi could be a life-changing experience for you.